After around a year’s agonising research, I’ve finally invested in the Canon TS-E 24mm. Whilst the 24mm end of my 24-105mm zoom was wide enough for me, it’s just not sharp enough for what I want to shoot. Tempting as it was to go wider and get something like the Zeiss 21mm, the image circle of the TS-E is so vast (to accommodate all that shifting) that if you choose not to tilt or shift, you get a superbly sharp result. So far in the field, so good. It’s a thing of beauty. I’m also looking forward to deploying the tilt (or swing, as above) features to drop out elements of backgrounds in light paintings. 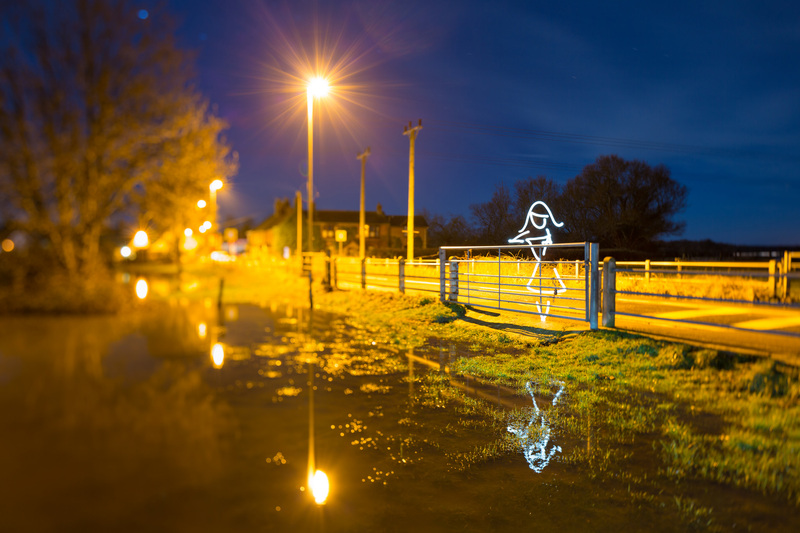 This is my first attempt at it – I wanted the girl and gate and blades of grass in the flood water, but didn’t need the distraction of a forensically sharp set of houses and a petrol station behind her. I’m sure I’ll get even more mail about processing, which my light paintings attract anyway! I’d forgive anyone for mistaking this shot for lots of Photoshop, but all I’ve done is drop in the reflected street lamp from a still image – with me wading up to the gate, etc. there were just too many ripples and the reflection stretched out of the bottom of the frame. Looking at it now I think it might still need some WB tweaks – it’s a little orange, but the 5D MKiii doesn’t get on with deep blue skies, and too much WB adjustment can cause banding. Anyway – I hope people like it and can forgive my slow catch up time at the moment. Have a great week!